Whether you think it’s just a right of passage or it’s simply a fun activity for the kids, nothing is ever going to change the fact that making and decorating eggs is something that everyone looks forward to doing every Easter. But since this is a timeless spring tradition, we’re pretty sure all will agree with us when say-- the only hard part about making Easter eggs is figuring out what theme you’ll go with this year or which designs you haven’t done yet in the past. The design possibilities are just endless after coloring your those hard-boiled or blown out eggs with food color. So to save you the time and effort, allow us to give you inspiration on some of the most unique Easter egg designs you can actually go with this year. If you’re really serious about making your Easter eggs a little brighter this year, then this is the design you should definitely go for. Those with crafty hands will definitely need to put it more skill and attention to do this leveled-up ombre eggs but this kind of work will of course pay off once you see the results. Mix colors using ⅓ tsp (¼ tsp for yellow) gel food coloring, enough warm water to cover eggs and 1 tsp white vinegar. Dip egg fully in dye and let dry. Dip the egg again ¾ of the way into the dye and let dry. Repeat in quarterly increments. Of course you can do this in any shade or color that you like. Millennials will have some serious fun making or even just looking at these Easter eggs that seem like Pantone color swatches. Just do your research on recent years’ winning Pantone shades, and color your eggs with them! You may even add the Pantone code or label for a more professional look! Just mix the gel food coloring with warm water and vinegar to achieve the Pantone shades you need - one cup (small enough not to fit the whole egg) per color/dye. Now dye your boiled eggs by letting them stand vertically inside the cup of dye. Now if you’d like to put the Pantone label, just print the words and codes backwards on inkjet temporary tattoo paper so you could transfer/stick it on to the egg. Your personal collection of nail polish will definitely come in handy for this design. You may either do this on plain white boiled eggs or even in colored ones (just in case you’ve already dyed some eggs with food coloring). It’s simple, actually. Just pour a few drops of any color/s of nail polish onto a bowl of water. 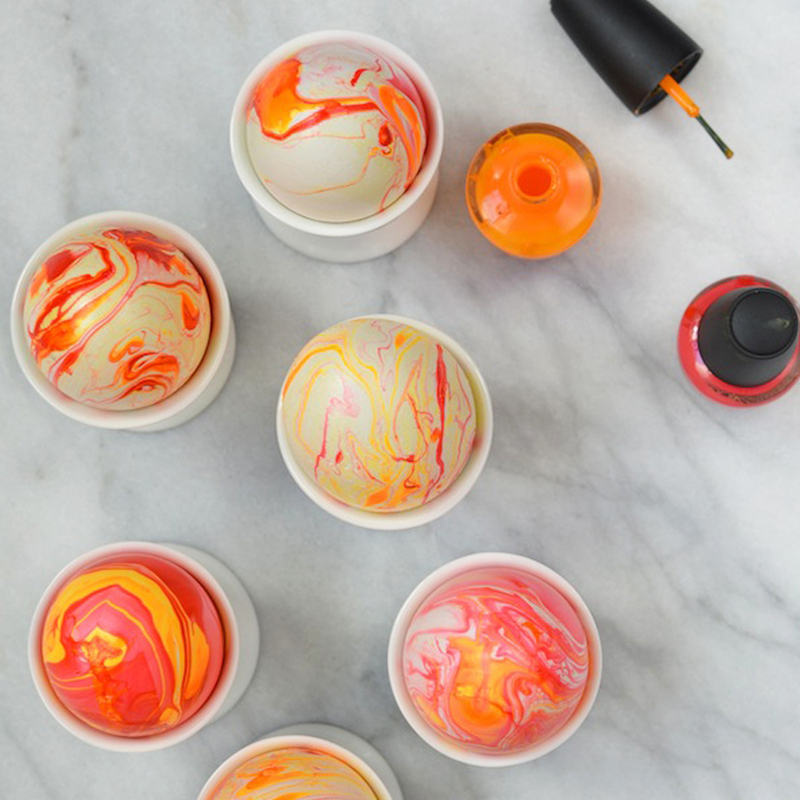 Put your creativity to test as the nail polish swirls will result in varying marbleization effects. Then carefully submerge the egg into the water until it’s completely covered. Quickly pull out. Then set aside the egg to dry. If you’d like to change colors, just scoop out the nail polish from the water surface and repeat steps. Prepare to use some gloves so you won’t have to use up a ton of nail polish remover after the whole process. If you think you’ve already done enough pastel, neon, and bright colored Easter eggs for the past years, then it’s time you go metallic! 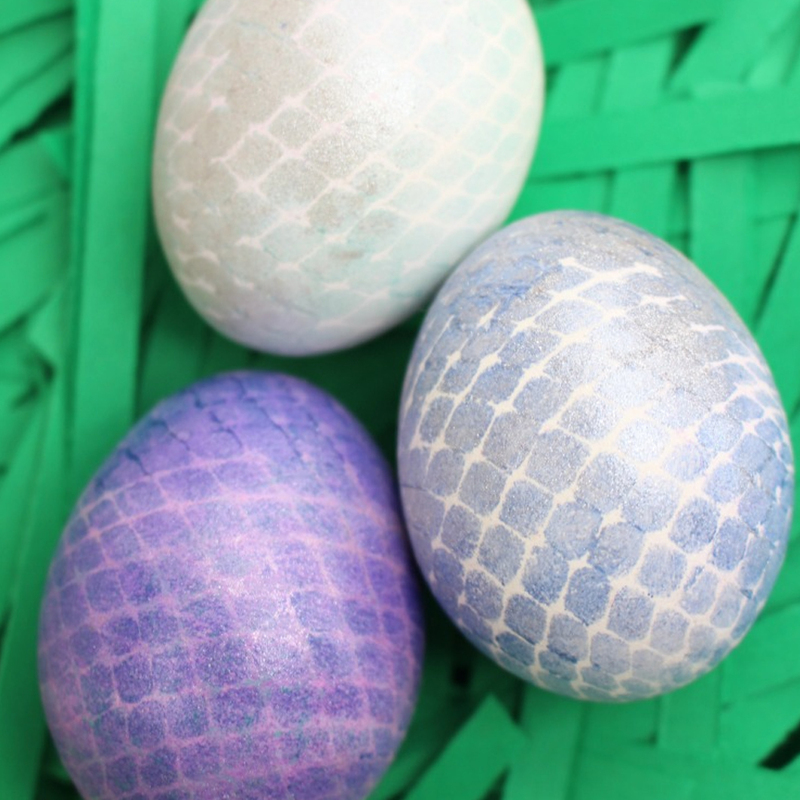 Make your Easter eggs look a tad bit more dreamy by creating these mermaid-inspired eggs. Cover each plain white or already-colored boiled egg with netting or an unused fishnet stockings. And secure with a rubber band. Apply metallic nail polish on to the netted egg using a sponge. Or if you have an airbrush kit, you may use the Chefmaster Airbrush Metallic Food Colors. Sprinkle edible silver dust on a table napkin and gently roll the painted egg in (without removing the net yet). Blow dust off and remove the netting. If you don’t think these burger slider eggs are just some of the cutest Easter eggs you’ve ever seen, we honestly don’t know what is! Well apart from them being really cute and unique, they’re just the perfect idea to make if what have in your pantry or fridge are brown eggs--no need to recolor! The double-sided edible food markers from Chefmaster will make these a lot easier to create. Just draw on the hamburger patty, tomato, and sesame seeds directly on to the egg. Cut out small triangles from yellow paper for the cheese, then use green streamers (tissue paper-like) for the lettuce. Glue them to each egg, and you’re done!